Junya Watanabe has joined with Vans on the Sk8 High. 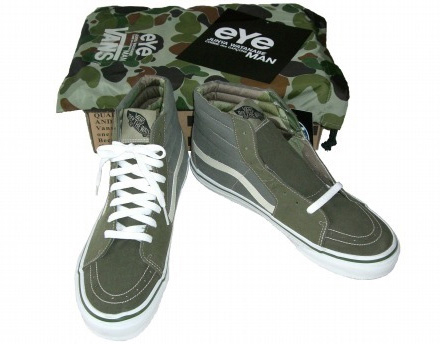 Overall they are pretty simple, containing a Military Green and solid White midsole along with accents throughout the Vans Sk8 High. Along with the sneakers you get a camouflage bag. A release date has not been determined as of yet, but they will more than likely release at Comme des Garcon shops across the world. Via Sneakers.